When more conservative treatments fail, surgery is a successful option. Only 5% of patients experience symptoms after surgical treatment. This simple procedure can be done in several ways, depending upon your particular case and the surgeon's experience and preference. The thick ligament on the palm side of your carpal tunnel is cut, allowing the contents of the tunnel to expand and the pressure to be reduced. The procedure is ordinarily done in an outpatient setting under local anesthesia, some circumstances may recommend that a nerve block be used to interrupt pain signals. General anesthesia—where you’re unconscious—is rarely necessary. You’ll be put into a hospital gown and taken to a surgical suite (operating room). After you lie down on an operating table, at least 1 IV line will be attached to a needle in your vein, and monitors may be attached to you to keep track of your heartbeat, blood pressure, and oxygen levels. If you've requested it, you may be sedated for additional comfort. An arthroscope to see the carpal tunnel in greater detail. This procedure will take slightly longer, mostly to set up the equipment. 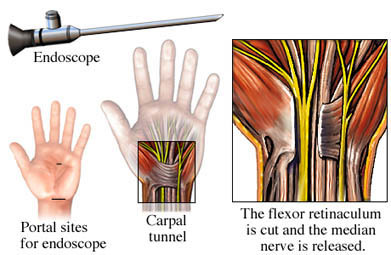 During the arthroscopy, the surgeon can put small instruments into the carpal tunnel to cut the ligament. Each of these procedures takes only a few minutes. Afterward, your incision will be closed, and you will be taken briefly to a recovery room where the effects of the sedation or anesthesia can wear off and you can be monitored.